Can Art Get on Base at Nationals Park? Please don't wear one of those pink Nats caps. Just please. Don't. Does any art have a place at Nationals Park? Both Michael Neibauer at the Washington Business Journal and Mike Prada at SB Nation write about the new art coming to Nationals Park with a hint of casual disdain. Neibauer introduces the work as "hopefully the least disagreeable," comparing it to the swinging statues no one much cares for. Prada says it outright: "[T]here's also something to be said for keeping things simple. 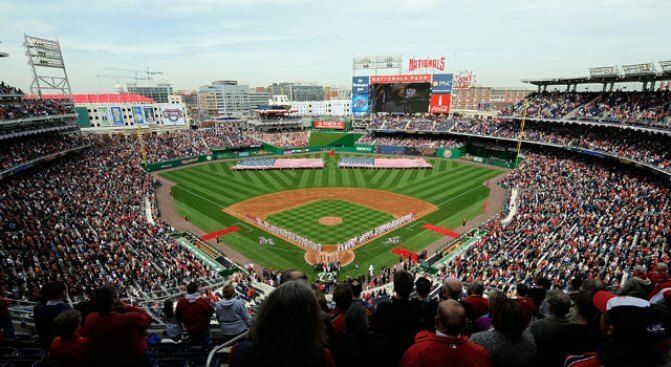 This newest proposed piece of art at Nationals Park is anything but simple." Thomas Sayre with Raleigh, N.C.-based Clearscapes Inc. is designing 30 “stainless steel-domed forms which will accurately follow the theoretical model of the trajectory of a curving fast-ball pitch,” said Sarah Massey, spokeswoman for the D.C. Commission on the Arts and Humanities. They will be suspended by early next year from the eastern garage. The steel spheres with cutout “laces,” each seven feet in diameter, will feature programmable LED lights for an “iconic ‘wow’ factor,” said Gloria Nauden, the commission’s executive director. Prada thinks this sounds needlessly complicated, but in execution it's going to make perfect sense. The lights will light up in sequence so it looks like a baseball is speeding across the way. That's it. Prada doesn't zero in on finer aesthetic problems. Instead, he questions the price tag -- "nearly seven figures" -- and echoes D.C. Councilman Jack Evans's call for more traditional artwork. The cost is a relative concern. Paying $0 for zero art might sound like the right figure to a lot of fans. The ballpark isn't a museum, after all. But a sterile ballpark's no good, either, and stripping it down of any décor might make it unsettling to visit. And frankly, Southeast needs something. Anyone who's caught an afternoon game can see that the neighborhood built up around the ballpark is square, flat and drab. That part of the District might be the most soulless place in the city. Load up a baseball simulator on the Playstation and check out the difference between gorgeous PNC Park in Pittsburgh and boxy Nationals Park in D.C. It looks like the latter was composed on an Atari. There ought to be an opportunity to introduce some art to the stadium and some vitality to the neighborhood. What if it were near the stadium -- and took the form of a public art project? Perhaps something near if not inside the stadium? There's no accounting for taste, but art designed to evoke baseball inside a baseball park does not aim especially high. A project that wasn't limited from the get-go could be a boon for baseball fans and neighborhood residents alike. Stephen Strasburg has improved the Nats' fortunes. Who's to say that the ballpark's art can't win, too?